Bathroom got you down? At the Bathroom Place, we understand that today you want your home bathroom to be like a spa. We’ve put together a short bathroom planning guide to help you find inspiration, choose the right elements and actually get started with your new bathroom. Whether you have ample space or limited space to work with, read on to discover essential layout tips for remodeling any and every bathroom. A lot of planning goes into a bathroom redesign. If you decide to do most of the work yourself, you’ll need to check electrical, water and waste installation regulations to ensure your new bathroom will turn out safe and code compliant. If your bathroom makeover involves a complete tear down and rebuild, it’s a good idea to find professionals who can help. When you don’t want to do most or any of the manual work, you’ll likely need a plumber, electrician, tile professional, cabinet professional and carpenter. At the very least, strongly consider hiring a plumber as this part of the remodel requires the most expertise. A well thought out, functional floor plan is essential for creating a bathroom you can enjoy for years to come. Consider how many people use your bathroom and what it is most often used for. Design the room with function first and foremost in mind. When planning your layout, decide how many “wet walls” (walls with plumbing) you want and can afford. The more wet walls you have, the more flexibility you’ll have. The remodel process will be faster and cheaper if you use existing plumbing and electrical hook-ups. Powder Rooms: Commonly located on the first floor and used as a guest restroom, these half-baths contain a sink and toilet but no shower and are often the most economical to remodel. Keeping your sink and toilet on the same wall saves labor and supplies and is a popular layout choice for smaller bathrooms. Attached Baths: When remodeling a bathroom attached to your bedroom, there are special considerations to keep in mind. If there is no window in the bathroom, an exhaust fan is essential for removing moisture and covering noise. Attached baths are also ideal for upgraded toilets that utilize quiet, modern inlet valves. Custom Bathrooms: Perfect for master suites, custom bathrooms allow you to install a completely new set of fixtures as well as matching, built-in cabinets and countertops. Popular choices for custom baths include two sinks and extra storage. When considering a completely custom design, it will likely be easiest in the long run if a professional helps with the design layout from the beginning. Remember: bathroom fixtures require space around them in order to be used comfortably. Make sure there is room for the door to open, space for you to stand in front of the sink, space in front of the shower, storage that is accessible and space for a wastebasket. 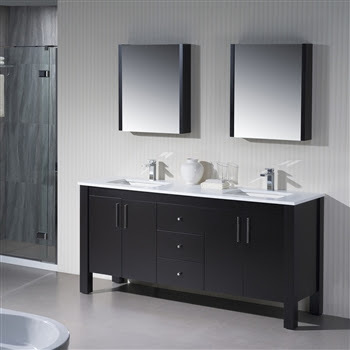 Whether you’re completely redesigning an old bathroom or you’re simply looking to upgrade some fixtures, the Bathroom Place has a wide variety of quality vanities, sinks, showers, toilets and more. Visit our site today to discover what possibilities are waiting for you!